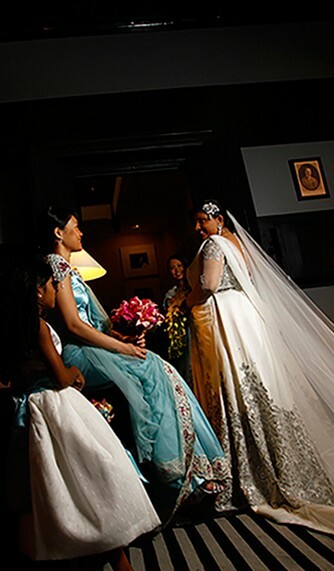 A “Fusion Couture” wedding dress or cultural ensemble is a perfect blend of eastern features and drapery, with western silhouettes or construction methods. So we start with ideas and inspiration from which we draw a multiple sets of designs for you to select from or we can look at a concept you have and have is recreated. - Delicate embellishments are all beautifully had done. This service is suited for those wanting to celebrate different cultures or your very own, with a perfect incorporation of your own personal design aesthetic. We are just a click away, from making your bridal ideas a reality and have a read of our process on making it all happen. Have a tété a tété with Dilly to discuss all your cultural needs, ideas and any concerns you have. A selection process of you editing and selecting a bridal concept from the many that will be drawn for you to select from. Custom designed embroidery designed and sampled for approval IF needed for the selected design. Choose from a selection of the finest fabrics, laces and embellishments, from beads to crystals. Order confirmed once first payment received and colour confirmed. There will be up to three fittings to the big day to ensure your dress is pure perfection.